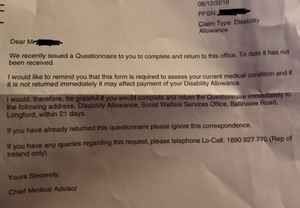 The Department of Social Protection is using dirty tactics to cut people off Disability Allowance by sending letters dated up to two weeks previous with a 21 day deadline to have them returned and despite recorded deliveries of return later claim they never received it. Instantly suspend and then reinstate claiming it was found. Take a look at the above for a person I recently helped with this. Who received another letter this morning. There’s no mention either of withdrawal of disability allowance in the first letter. First letter received 27th of November and second on the 16th of December. By the looks of the letter too (barcoded) they appear to be randomly generated. Posted in Misc and tagged Ask A Broadsheet Reader at 3:39 pm on February 1, 2019 by Admin. what is it with state bodies in this country and their contempt for the people they are supposedly meant to help? Eh excuse me….I am not a person….I am a customer thank you very much. hahaha. oh yea, i forgot Regina re-branded us as customers. Minutes to landlines, why don’t they put a landline number on. ? 1890 numbers can cost you from 5c to 31c per minute depending on whether you’re calling from a landline or a mobile. Yep 31c per minute adds up when (no doubt) you’ll be put in a queue, then transferred to another, and then have to call back a few more times when no one deals with it anyway. Fill in the form that was dated 3 weeks earlier is it, then reissue another letter saying we never got your form you’re being cut off. Clearly a bunch of letters were not posted after they were written/generated internally… more incompetence. I have an idea, when generating yer letters future date um coz ye won’t get around to sending them for a while and give people longer to get their forms back in coz ye wont read um for months if ever. Or just cut people off their payment for the lols & see if they notice.. goons. I doubt these dirty tactics are done on purpose though that would take coordination & planning.. I will try to post again, censorship for this? its not like you are busy, just respond instead of pumping bile here. What makes you think they didn’t respond? Perhaps you can only do one thing at a time and assume others are also limited in that way? There’s no bile there. It is simply a factual description which you obviously haven’t read as the original post says the person writing is helping the recipient of the letter. You can make no assumption about how busy they are. 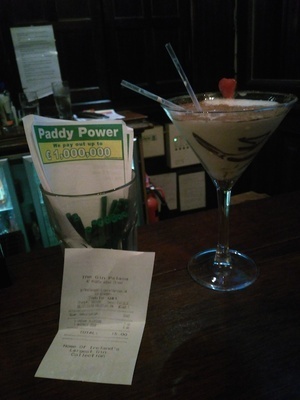 They also posted on boards.ie not here. The problem with the DSP is not that they are plotting, it’s that they haven’t a clue what is going on, and haven’t for years. What is the number one reason people get disability payment? Back pain? Amputated limbs? You don’t know? Neither does the DSP! They simply don’t know.. They have no records. 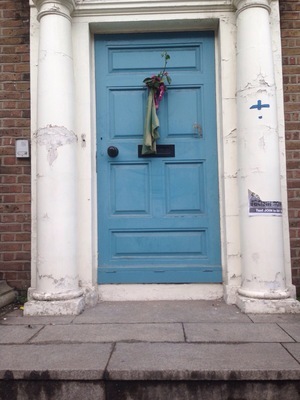 There are 230,000 people in the state drawing disability, illness or injury invalidity benefit every week, and while everyone knows that nothing like that number – which would be Lansdowne Road full five times over – are actually disabled in the sense that an ordinary person would understand it (eg. 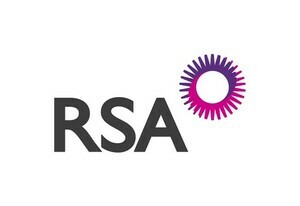 being in a wheelchair), the Department has no idea which ones are actually unable to work and which ones are just people who were once unable to work but who are actually fine now, but, quite logically, prefer to stay on disability allowance, with extra benefits such as free travel, than go on Jobseeker’s Allowance and have to prove to nosy civil servants that they are actively seeking employment. Any normal person in that position would do the same, but it is galling everyone else, both those paying the benefits through their taxes and those who are being forced to engage in the sometimes pointless but sometimes fruitful ‘activation measures’ to get people off the dole and into badly-paid work. So in that context, I don’t think it’s the end of the world to ask everyone who is claiming to be disabled why they are disabled. It would be nice, though, if the Department (a) just admitted the above in an open way and asked people straight up for proof they were still disabled, and (b) didn’t feck around with the dates on the letters to try to put everyone under unnecessary pressure and fear. There’s more to being disabled than being in a wheelchair. It’s an intentional trap by State policy. It’s a government policy tactic to cut off disability by compounding the stress and interruption that accompany Christmas season. The Department of Social Protection should take appropriate action to prevent this ever occurring again. ‘You’ need to have this in writing from them. 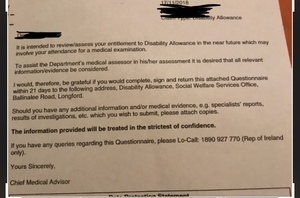 You will have to write to Minister Regina Doherty (DSP) and Minister of State for Disabilities Finian McGrath, and include evidence of posting review (questionnaire). They will have to investigate your complaint. 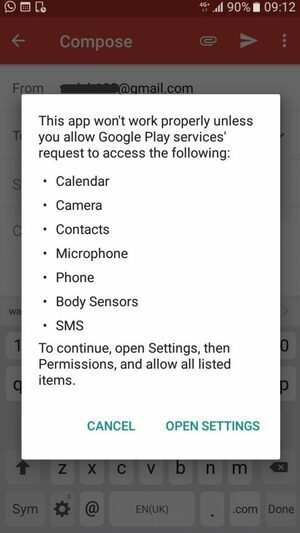 Despite not being given 21 days formal notice, you managed to submit your review within the timeframe, but it was not completed in a timely manner by DSP, resulting in you receiving an unnecessary auto generated reminder and stressful overdue letter threatening suspension AT CHRISTMAS TIME.